Today I'm taking part in this weeks Mojo Sketch Challenge, and as I couldn't decide between Blushing Bride and Pool Party, I made two cards, using both colours. Which do you prefer? Unusually for me, these cards were also made in C5 size (a sheet of A4, folded in half), and I'm pretty pleased with how they turned out. My card was decorated with a white panel of card measuring, topped with a coloured panel of card measuring, topped with a sheet of Designer Series Paper (or DSP) measuring. I then took my 1 1/2" Circle Punch and punched out four circles for each card from a sheet of DSP, and using my 1 3/4" Scalloped Circle Punch, punched out four more circles in the same colour card as the card blank. 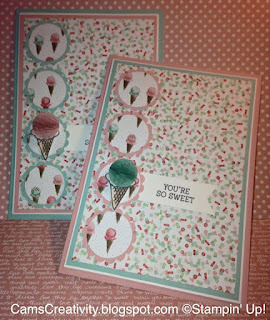 These were matted and layered together, before attaching to the card using Stampin' Dimensionals. 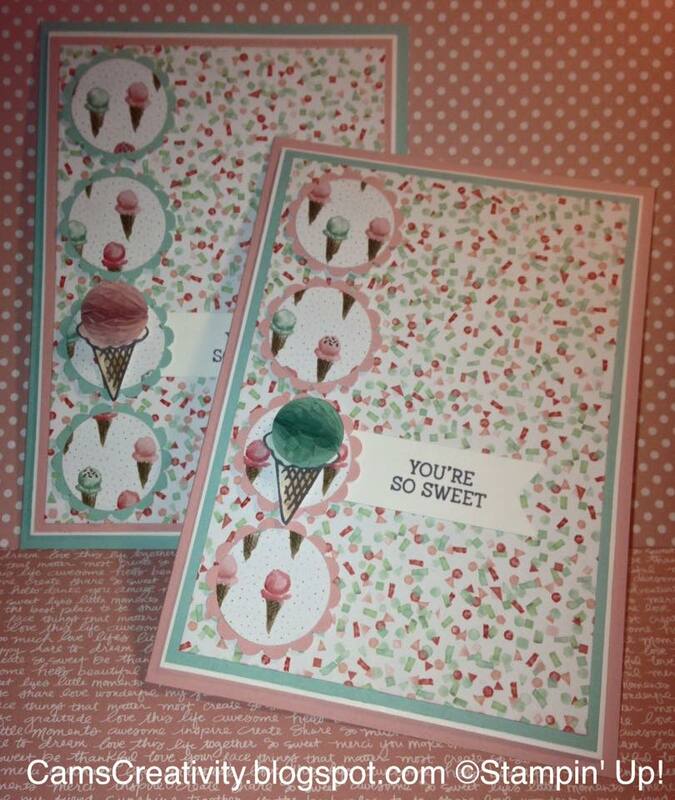 Then, on a sheet of Shimmery White card, using a Basic Gray Archival Stampin' Pad, I stamped an ice cream, using Classic Stampin' Pads and Aqua Painters for a watercolour effect. Once dry, they were cut out, stuck to the card using Stampin' Dimensionals, and matching Honeycomb Embellisments were applied. The greeting was then stamped onto a piece of white card, measuring 1" x 3 1/2", using Basic Gray ink, and the end was then punched using the Banner Triple Punch, before sticking to the card (behind the scalloped circle) using Snail Adhesive. Labels: Aqua Painters, Banner Triple Punch, Birthday Boquet, Cam's Creativity, Honeycomb Embellishments, Honeycomb Happiness, MOJO436, Stampin' Up!